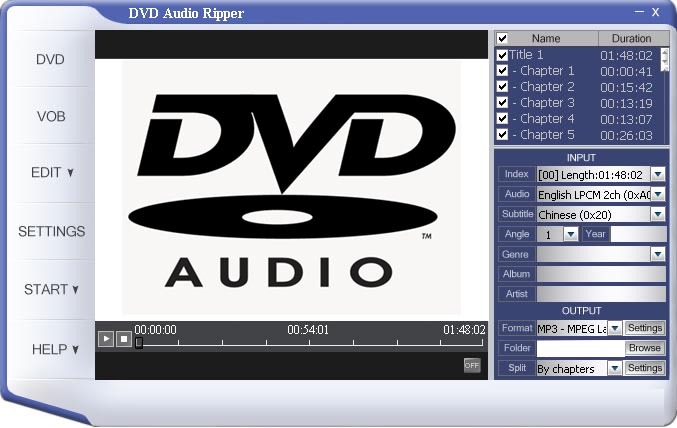 The DVD Audio Ripper Deluxe provides a simple, fast method to extract DVD audio to MP3 or WAV format. No more multiple programs, no more complex progress, as easy as 1-2-3. It can not only rip DVD chapter by chapter, but you're free to rip by custom size or time. With DVD playback supports, you can rip anything as you like, no temporary file required. It also supports Multi-Angle DVD and copes with these Multi-Angle chapters in the right way. ...... It also support Multi-Angle DVD and copes with these Multi-Angle chapters in right way. With new tech supports, it works well and fast with all types of DVD. Now you can listen to your favorite movies on your iPod or PSP! Converts DVD to AVI, DivX , WMV, MP4, MP3, WMA, iPhone, iPod, PSP video. Qweas is providing links to CNC DVD Audio Ripper 2008.3.1.0423 as a courtesy, and makes no representations regarding CNC DVD Audio Ripper or any other applications or any information related thereto. Any questions, complaints or claims regarding this application CNC DVD Audio Ripper 2008.3.1.0423 must be directed to the appropriate software vendor. You may click the publisher link of CNC DVD Audio Ripper on the top of this page to get more details about the vendor.